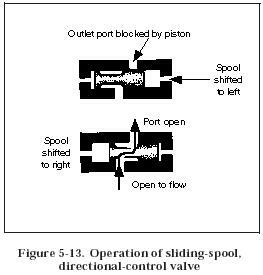 Figure 5-13 shows a sliding-spool valve. The valve element slides back and forth to block and uncover ports in the housing. Sometimes called a piston type, the sliding-spool valve has a piston of which the inner areas are equal. Pressure from the inlet ports acts equally on both inner piston areas regardless of the position of the spool. Sealing is done by a machine fit between the spool and valve body or sleeve.